Violent Reforms or Labor Martyrs? The Molly Maguires were a secret society of Irish- American coal miners in the Pennsylvania coal region. The Molly Maguires wanted fair treatment and safer working conditions. This led to a bitter dispute with the coal companies called the 'Long Strike of 1875'. The Molly Maguires were a militant, secret society. They got their name from a feisty Irish woman named Molly Maguire, who led a violent raid against landlords in the 1840s in Ireland. The people who had followed the real Molly Maguire became called Molly Maguires. They were well known for getting into fist fights and using violent tactics against the landlords in Ireland. When Irish - Americans in the Pennsylvania coal mining region began their secret labor union, they adopted the name. In 1845, one million Irish immigrants left Ireland to seek a new life in the United States. The Irish Potato famine had left farmers broke and starving. They came to America to start over. The men took work where they could get it. Many men took railroad and coal mining jobs in Pennsylvania. In Pennsylvania, Irish coal miners faced dangerous working conditions and discrimination. The Workingmen’s Benevolent Association known as the WBA began in 1864 to improve working conditions in the mining industry. The organizers of the WBA did not like the Irish - Immigrant workers and discriminated against them to the point that Irish workers formed their own union to protect Irish workers. The Irish group was known as the Ancient Order of Hibernians or the AOH. Only Irish-Americans or people of Irish descent were permitted to join the AOH. The members of the AOH that proved to be dedicated and loyal members were inducted into a special group. The members of the group were kept a secret because they used violent tactics to gain better working conditions. This secret society within the AOH were known as "The Mollies". The Mollies were angry that there were no safety rules required for coal mines. Many men and boys working in these mines suffered from work related illnesses and injuries. Some workers were even killed on the job in mining accidents. They were also angry about the treatment of children in the mines. 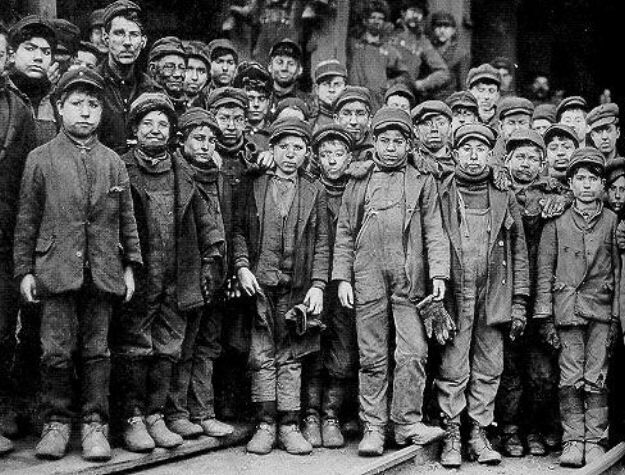 Irish children as young as seven worked in the mines for $1 - $3 per week. If this wasn't bad enough, coal companies began hiring workers to replace Irish workers. This led to the Long Strike of 1875. Frustrated Molly Maguires began using aggressive and even violent tactics in their efforts to gain better treatment. They used intimidation, beatings, arson, and killings to fight for better working conditions. Mine owners who suspected that a worker was a Molly would beat up and even kill miners. The struggle reached its peak in 1875, when mine owners hired the Pinkerton Detective Agency to stop miners from joining unions. Franklin B. Gowen was the president of the Philadelphia and Reading Railroad, and the Philadelphia and Reading Coal and Iron Company. He hired the Pinkerton National Detective Agency to stop the Mollies from striking. Pinkerton hired James McParland, an Irish-Immigrant, to go undercover against the Mollies. He used the name James McKenna and worked to gain the trust of the members of the AOH. It was not long until he won their trust and was inducted into the Molly Maguires. McPharland was a member of the Coal and Iron Police. The Mollies called them the "Pennsylvania Cossacks". They were the private police force of the coal companies. McParland gathered information against the Mollies and took it to the authorities. In 1875, 60 Mollies were arrested. The arrests ended the strike, however the Coal Companies wanted an example to be made and the men were put on trial. They charged them with violent crimes, such as murder, though there was no evidence that the Mollies were involved or that the Mollies' Secret Society even existed. The trials ended with the twenty guilty verdicts. These 20 Mollies were sentenced to hang to death. Newspapers looking to make money covered the trial and convinced people that Irish Immigrants were bad for America. The papers made these men look so badly, that the Catholic Church excommunicated, or kicked them out, and denied them a Christian burial. People believed the Mollies were murderers and exaggerated their tactics by saying it was common for the Mollies to commit "floggings, lynchings and tar-and-featherings". 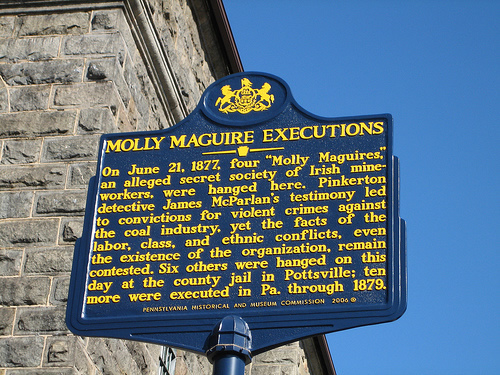 The Molly Maguires that were hung became martyrs for the labor movement. This meant that they became respected by labor reformers because they did not back down and were willing to die for what they believed in. 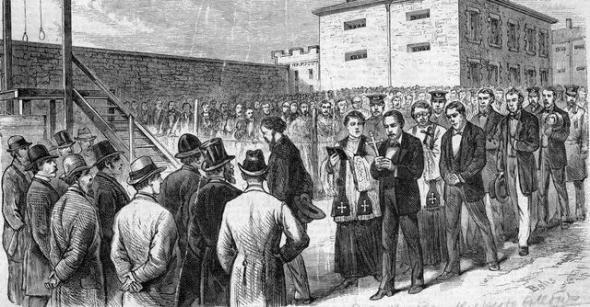 Whether you look at the Molly Maguires as violent reformers or Labor martyrs, the Mollies did use aggressive and violent tactics. These tactics caused them to lose support and they eventually fizzled out.